We are considering a project to permanently close the low water crossing on Old San Antonio Road near Southpark Meadows. This low water crossing is very dangerous when flooded. Up to 16 feet of water could potentially pass over the roadway. Since 2013, there have been five flood-related incidents at this spot. 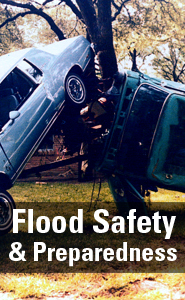 Every incident puts the driver, the passengers and emergency responders at risk. The project team explored other options, but is making the recommendation based on cost, constructability and effectiveness. 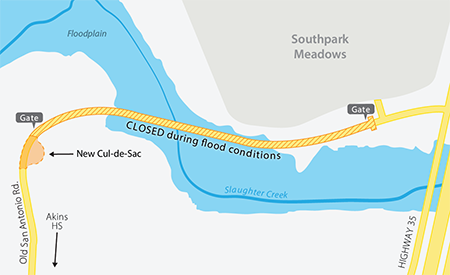 The low water crossing will remain open to pedestrians, bicyclists and emergency vehicles. The historic bridge will remain. 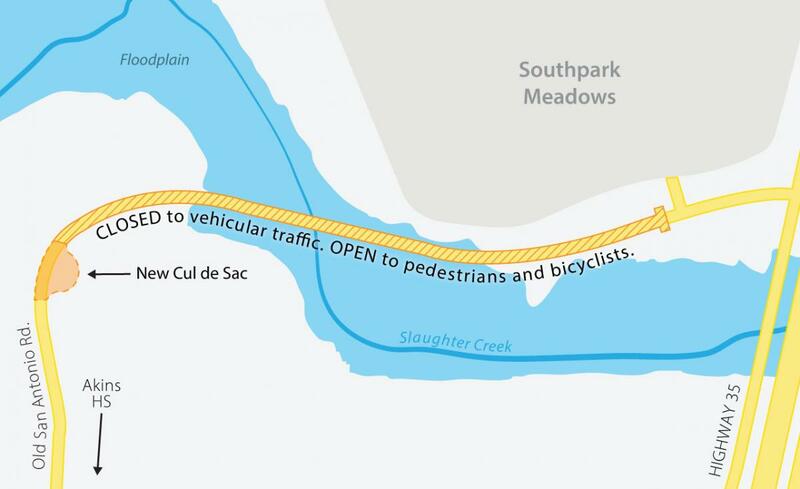 A cul-de-sac will be built on the west side of the low water crossing to allow vehicles to turn around easily. A new fire station is scheduled to open in 2019 at the intersection of Old San Antonio Road and FM 1626 and will be able to respond quickly to emergencies. The City of Austin is in the early planning stages for an extension of Brezza Lane and a traffic signal on FM 1626. Reem Zoun, P.E., Supervising Engineer, 512-974-3354. Send an email to Reem. Jose Ibarra, P.E., Project Manager, 512-974-7195. Send an email to Jose. If you would like to receive email updates about this project, send an email to Stephanie Lott or call 512-974-2799.